Study volcanism in Munich? 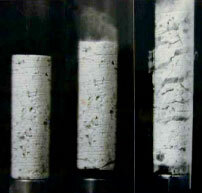 There are four experimental volcanoes to study the phenomena of explosive volcanism at the department. The laboratories of experimental volcanism at the Ludwig Maximilians University of Munich provide unique opportunities to study the physics of mechanisms that are beyond direct access. Experiments are designed to analyze the behavior of magma under conditions as close to nature as possible. Here experiments meet physical volcanism and numerical modeling. International projects and cooperation are the basis of our success.